Juntucha is a meeting point for travelers to meet new friends, in addition to learning Spanish, there are plenty of other things to do in and around town. We work together with local travel agency El Mundo Verde in organising the tours. Continue reading to find out what the possibilities are or take a look at their website for more information! Get to know the city where you are learning Spanish and join in on this tour! 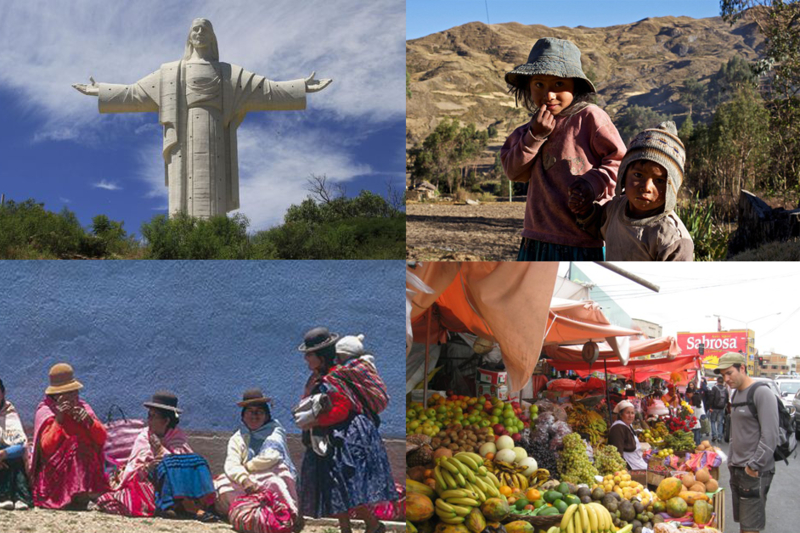 Cochabamba has much to offer: stroll on La Cancha, the largest market in South America, visit colonial cathedrals or check Cristo de la Concordia, the world’s largest statue of Christ. A guide who speaks both Spanish and English and who knows a lot about the city will guide you (so the tour is also suitable for people who have just arrived). That means you will get to see places that tourists do not know of! Just three hours from Cochabamba, lies Incachaca, a place that is situated on the edge of the rainforest. There will be a stop at Lake Corani and in Incachaca we will hike through the rainforest. The natural beauty is breathtaking: there are waterfalls; water pools with crystal clear water and a 60-meter deep canyon. You will also have the opportunity to spot rare bird species. Imagine yourself for a moment living in the time of the Incas in Incallajta! This city is the largest and most impressive Inca city of Bolivia and served as the easternmost fortress of the great Inca Empire. Until 1525 the fort was manned and the massive stone structures of the huge fort demonstrates the glory of the ancient Inca Empire. Explore one of the largest pre-colonial buildings in the southern hemisphere: La Kallanka, a building of 22 meters wide and 78 meters long. There is also a waterfall with a fall of 30 meters, which was probably used for ritual ceremonies in Inca times. The Pico Tunari with 5035m is the highest mountain in central Bolivia. The climb of the snow-covered top is not for sissies, but definitely an unforgettable experience. You will climb up accompanied by a guide. If you are brave enough to make the long and difficult journey, you will be rewarded with a view that you will not forget … Do you dare? In four hours you will be driven from the dry valleys around Cochabamba to the steamy, dense jungles of the Chapare. Once you arrive at the final destination, Villa Tunari, you can take a refreshing swim in the crystal clear waters of the pozas (natural water holes). Get ready for a healthy dose of adrenaline because on the second day we will go rafting on the Espíritu Santo, the best rafting river of Bolivia. In the afternoon there’s a tour in the park La Hormiga. Here you can see different kinds of animals such as crocodiles, alligators and armadillos. On the third day you can visit the Parque Nacional Carrasco. This park has a very diverse biodiversity due to height differences. You will have the opportunity to see rare birds such as the blind Guacharovogel and the rock rooster. A must see for bird lovers! Nowhere in the world can you be so close to dinosaurs as in the Torotoro Park. This is the only place where you can see dinosaur prints from six different eras. The park is also known for impressive rock formations from almost 4000 meters deep canyons and numerous waterfalls. Experience the beauty of remarkable and natural formed landscapes in the Torotoro Park.